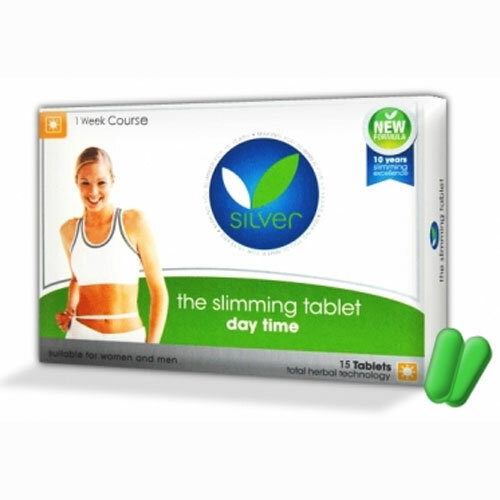 Now with an updated, improved slimming formula, Silver�s NEW Slimming Tablets are better than ever before. Blister packed for easy, discreet transportation (no rattling bottles!) the new tablets, suitable for women and men, are the ideal solution to shed pounds of weight quickly and easily. No dieting, no lack of energy, no pain - just a simple and effective way to lose weight! DAY TIME FORMULA: Take orally 2 tablets per day. One GREEN tablet around 10am and another GREEN tablet before 3pm. Silver products contain only the very best natural ingredients, using themogenisis and appetite suppressants which can boost your body`s energy levels and increase your metabolic rate. Includes Green Tea leaf, Garcinia Comboia Fruit, Dicalcium Phosphate, Bulking Agent, Bitter Orange fruit, Panax Ginseng Root, Ginger Root, Vitamin B3 (Niacin), Pantothenic Acid, Vitamin B6, Cinnamon Bark, Croscarmellose Sodium, Anti-Caking Agent, Bergamot Fruit, Cayenne Pepperm Extract, Hydroxyproply Cellulose, Polythylene Glycol, Chromium Polynicotinate.